Why Should You Need To Buy Car Cover For Snow In Winter? Winter is the weather that usually causes horrible experience to human beings and their properties. 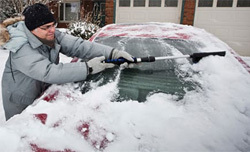 Most car owners usually find it difficult cleaning and scrapping snow off their vehicles every morning during winter. The chore of scrapping snow from car body and windscreen can be tiring that one has to look for the easiest way to avoid it. That is just the reason you should get a car cover for snow. The cover will help to protect your car from snow relieving you the stress involved in trying to clean up car every morning. What you simply need do is to go ahead and select the best brand in the market. That best brand you need is simply Lanmodo car cover. You are also going to get more of the reasons why you need car cover during winter season through this post. Hard to Clean: Cleaning off snow from car is not an easy chore. It is very difficult and tiring that you can spend several hours trying to get it done. Also, the effect of snow on your body is not good for your health. So, the best thing for you to do is to avoid this from happening by getting snow proof car cover. You can easily find several of this covers when you check the internet. It will be left for you to select the particular one that will meet your needs. Harmful for paint: You know how much it cost you to repaint your car after it was damaged by snow fall and hail. Therefore, it will be important for you to consider avoiding anything that can tamper with your car paint. Winter snow is one of the major things that can completely tarnish the paint of your car. To avoid this from happening you are simply need to get yourself a good car cover snow protection like the Lanmodo innovative automatic car cover. It is going to solve your problem and save you from stress. Cannot get start: When the temperature of your car get lower than normal due to snow fall on it, the engine will hardly start. In fact, you will find it difficult to start engine when you want to go to work in the morning. You can save yourself this stress simply by getting car cover against snow. Fluid thicken when car is exposed to snow fall: The viscosity of fluid such as engine oil, brake oil, gear oil and others are calculated before recommended for a particular vehicle. When the vehicle is exposed to show fall it can result to thickening of the oil or any other fluid increasing the viscosity of the fluid. Protecting the windscreen of cars from regular scrapping of snow which can result to scratch and reducing visibility of car user. It can help the car paint remains new for a longer time saving the owner the stress and expenses involved in repainting car. Protect your tyre pressure from the effect of extreme low temperature. Create welcomed barrier between the harsh winter weather and the paint on the body of your car. In fact, there are many more benefits associated with snow resistant car cover making it good for every car owner to get the cover. So, you can go ahead and search for the best car cover for winter snow in the market without delay.